A primary measure of an investments worth (or value) is based on yield and known as the internal rate of return - IRR. The internal rate of return can be defined as the break-even interest rate which equals the Net Present Worth - NPW - (Net Present Value) of a project in and out cash flows. For a given cash flow equation (2) can be solved by iteration. Minimum Attractive Rate of Return - MARR - represents the required or minimum acceptable Internal Rate of Return for a project investment. Engineering ToolBox, (2008). 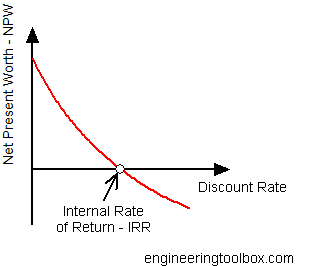 Internal Rate of Return - IRR. [online] Available at: https://www.engineeringtoolbox.com/internal-rate-of-return-irr-d_1235.html [Accessed Day Mo. Year].